This is a single action belt revolver, A.K.A. 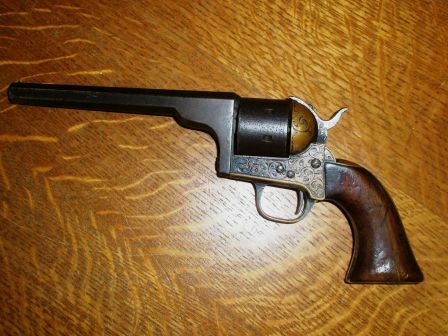 “seven shooter”, made between 1861 and 1863. It is a .32 rimfire. Loading is unique, barrel and cylinder swing to the right. There is beautiful scroll work on the body. There are markings on the barrel, “mfd. for Smith & Wesson” adding value to this piece. Many of these revolvers were know to have been privately purchased by Union officers and enlisted men in the Civil War. There are several notches on the grip. It could represent number of bunny rabbit or bad guy casualties. The hammer spring is broken but it is repairable. Find this item and other historical military items at the Albany Antique Mall, 145 2nd Ave, Historical Downtown Albany.